– Prices, names and unlocks changed. Hi powerkasi and you others i have one question. 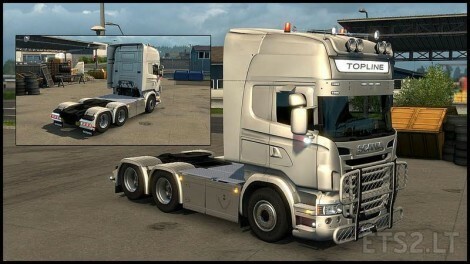 I have downloaded the mod Scania Mods v.1.1.2 and Scania RS modifications 1.5.1.1 but the sideskirt V8 logo wont show up on the options on the sideskirt option. Any suggestions? 2) I’m using the Trux roof bar, but it seems to be 1CM off of my truck (floating), so are the beacons. 3) Would love to see those torpedo lights in yellow or red too, but most of all that they could be in the painted color or black also. I Hope you’ll add the mod to steam workshop some time too, So I can keep enjoying your work when you update it.